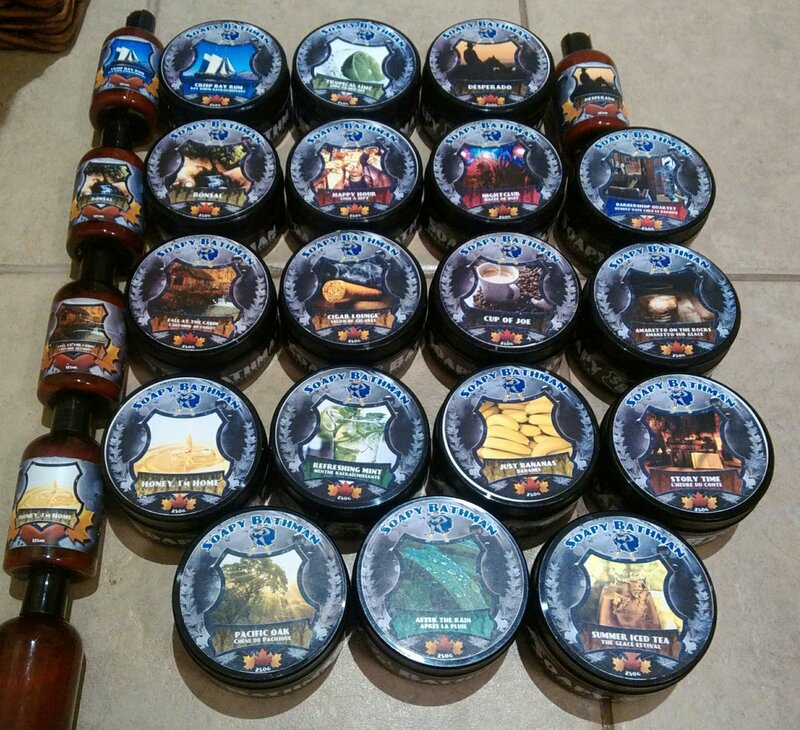 I would like to thank Jon for the incredibly fast delivery of my Soapy Bathman products. As far as I know he has the largest selection avaliable. Plus he carries a number of other artisians for a very reasonable shipping rate. For those who have never partaked in the world of Soapy Bathman please consider doing so. In my book they offer the perfect lather, slickness and insane post-shave feel. The balms are smooth and hydrating beyond words. Pacific Oak: smells like fresh cut wood and the great outdoors. Tropical Lime: reminds me of a lime sherbert, nice, crisp and bright. After the Rain: at the risk of sounding dumb it really does smell like an herb garden after a rain storm, I love this scent a lot. Story Time: Cherry tobacco at it's finest, what you would expect, very strong scent. Crisp Bay Rum: my all-time favorite Bay Rum, you need this in your collection. Bonsai: #1 summer fruit scent of all time, grapefruit, ginger and so much more. Desperado: leather, tobacco, anise, amazing cologne smell, Chuck Norris without the Steven Segal. I currently use his "Black Magic" soap frequently. It's the original formula and its performance and latherabilty is awesome. The scent is unique and is one of my favourites. I can't recommend the brand enough. Wow! You seem to like this soap almost as much as I like my preferred soap. (05-07-2016, 12:58 AM)Asafiev Wrote: I would like to thank Jon for the incredibly fast delivery of my Soapy Bathman products. As far as I know he has the largest selection avaliable. Plus he carries a number of other artisians for a very reasonable shipping rate. For those who have never partaked in the world of Soapy Bathman please consider doing so. In my book they offer the perfect lather, slickness and insane post-shave feel. The balms are smooth and hydrating beyond words. I'm so glad you enjoyed the soaps! Sorry I am so late in responding to this thread; I've been super busy and must have glossed over this. I do really appreciate your business and the kind words! Yeah, as far as I know he is not making that soap again... bah! Maybe if we ask nicely he might make another batch? I also have his Zombie Apocalypse waiting for me to try, I keep forgetting to pick it up from my family home where it was delivered. I'm a bit worried about it as I don't like cloves much, but I'm hoping the other 3 scents overpower the clove in the mix. Actually I understand the desire to try many of the Soapy scents, I always wanted to try the "I Can Breath" and the "Just Bananas", but they both got discontinued before I could order a sample. Chris' soaps are a great deal, but the 8oz size can be a bit much if you don't get along with the scent. Soapy Bathman soaps are one of my favorites, and his balms are top notch too. For some reason I sing "I'm a Lumberjack and I don't care" over and over in my head while shaving with them though! I have good news for you. You can still buy I Can Breathe From Tiki Bar Soap and last I looked Just Bananas was still avaliable from Shave Revolution.